Standing out in a crowd of competitors is not an easy task, especially not in our digital age. Despite the huge leap that we have seen in technology advancements - studies have shown that in-person interactions create a bigger impact when it comes to sales. Both in-person and online events are critical in the lead generation context. People do business with people. That's why 87% of C-Suite executives strongly believe in the power of live events. But did you know that the biggest challenge faced by roughly 50% of event marketers is achieving a satisfying response rate? Handwritten invitations can play a critical role in this context with RSVP response rates north of 20 percent. "87% of executives believe in the power of live events and are planning to invest more in the future." "77% of B2B companies define in-person events an integral part of their content marketing strategies." "50% of event marketers say getting attendees to respond to invites is their #1 challenge." In Europe sending (cold) email is illegal also in the B2B context without the explicit consent of the recipient. On the other hand sending personalized letters to (cold) contacts is perfectly safe and legal. "We've received great feedback and achieved an attendance record - and this is largely due to the handwritten invitations from Pensaki." 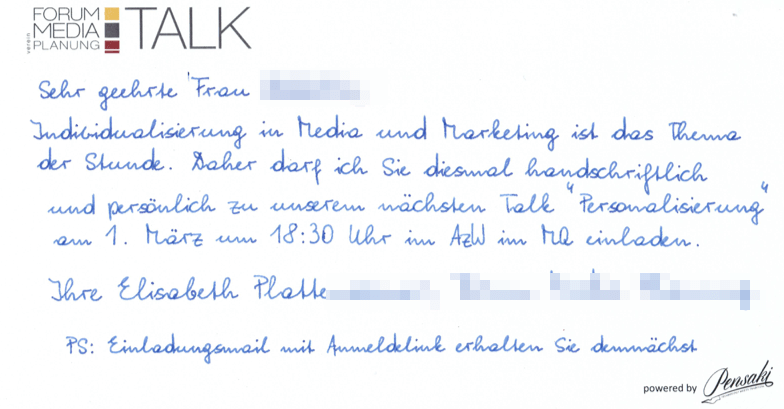 "Pensaki is possibly the coolest #marketing service I've seen... On demand, handwritten, direct mail"
A handwritten invitation in a hand-addressed envelope conveys attention to detail, exclusivity and quality and shows the recipient that they are special. Self-written invitations are always the best option, but if you lack the capacities or a neat handwriting you can use Pensaki to do the job. Writing invitations personally by yourself, i. e. grabbing a pen, is always the best alternative. However, should this not be possible due to the number of invitations (more than 100) or the legibility of your handwriting, Pensaki is an excellent alternative for you. We will gladly write 500 or 5,000 invitations for you in a bespoke handwriting – the recipients will be delighted. 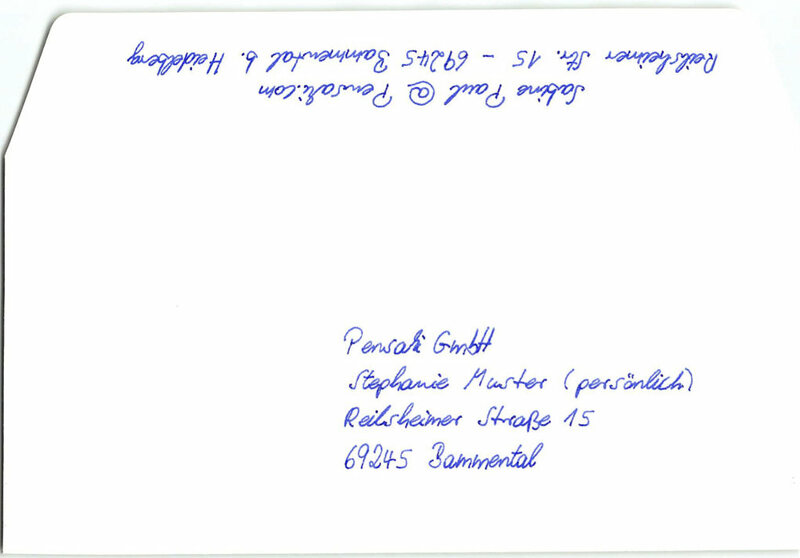 With Pensaki you can comfortably send out invitations and letters online in an authentic handwriting. This expression of esteem leads to outstanding results if you take the key success factors into account. With Pensaki, companies regularly achieve return rates of up to 40% in B2B customer acquisition. This is especially true when you use bespoke but neutral stationery. "handwritten envelopes have received almost three times as much response as printed labels." "A blue ink signature increased the response rate by 21%." If your invitation is sent in a handwritten envelope, it will massively stand out in the mail stack. Hand-addressed envelopes arouse the recipient’s curiosity, because such envelopes express appreciation towards the recipient. The results are open rates of up to 99%. Ordinary invitations use printed labels, while special invitations always stand out from the crowd. 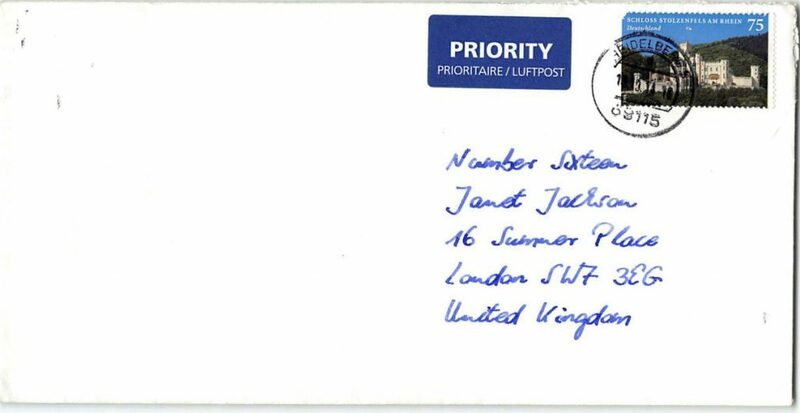 Presumably minor details matter a lot, and a hand-addressed envelope is already a great starting point to underline how important such details are for you. "As a matter of fact, the handwriting style conveys authenticity: if you look very closely, you can see the irregularly distributed ink, the minimal impression of the fountain pen on the paper..."
"I can confirm that this handwritten Pensaki postcard is so unusual and amazing... this is simply a great way to stand out from the massive daily media noise and to effectively engage with your customers." "For one thing, even the standard handwriting on the envelope looks authentic. You wouldn't suspect for a moment that the letter could have come from the uncanny valley of robots and avatars." Every document is written by friendly robots with a pen, but all subsequent steps are manually performed, by even friendlier humanoids. All letters are e.g. manually put into envelopes. This is an integral step in our quality control. 100% online order processing, including our API for an easy integration with e.g. your CRM or helpdesk solution. Pensaki combines the beauty of authentic-looking handwritten letters with a high degree of scalability, thanks to friendly and trustworthy robots. We provide a wide range of personalization and shipment options, incl. value added services. Please contact us if you want to learn more. Our standard handwritten letters are handed over for global shipment within 5 business days. If your invitation is sent in a handwritten envelope, it will massively stand out in the daily mail stack. If the invitation card inside the envelope also contains a personal handwritten message, the recipient receives the highest degree of personalization. Such invitations embody pure esteem and exclusivity towards the recipient. The results are RSVP response rates of up to 40%, because a handwritten message is very powerful in today’s digital world. The recipient values the creative aspect and also perceived costs that the sender has invested in his message. British marketing expert, Rory Sutherland speaks in this context about the concept of costly signaling. This sense of appreciation shows measurable results. The handwritten 580 invitation is for all those who want to write a longer message in the context of the invitation. If your invitation is sent in a handwritten envelope, it will massively stand out in the daily mail stack. If the invitation card inside the envelope also contains a personal handwritten message, the recipient receives the highest degree of personalization. Such invitations embody pure esteem and exclusivity towards the recipient. The results are RSVP response rates of up to 40%, because a handwritten message is very powerful in today’s digital world. The recipient values the creative aspect and also perceived costs that the sender has invested in his message. British marketing expert, Rory Sutherland speaks in this context about the concept of costly signaling. This sense of appreciation shows measurable results. 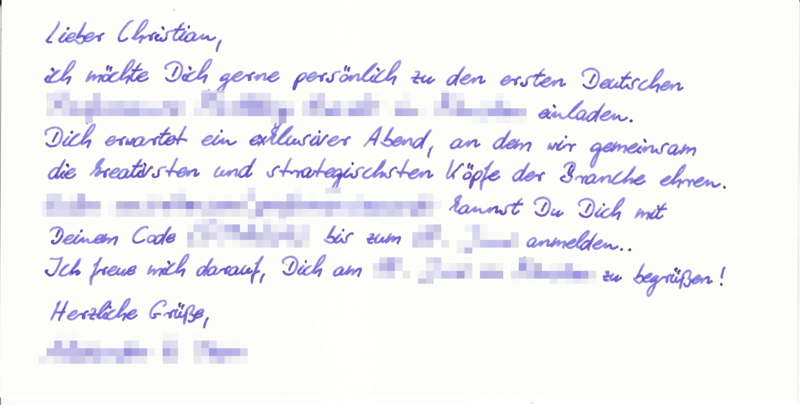 "80% of Germans love to find handwritten mail in their mailbox"